Today we join with millions of Scouts across the world, as we remember the founder of Scouting, Baden-Powell. Baden-Powell started Scouts for children, his mission was to provide a programme that developed the character of young people and made them useful citizens, able to look after themselves and develop skills which would serve them well throughout their lives. We now live in a very different world, with many distractions for children, a main one being social media, along with the “need” to follow the trends and fashions of their friends. Scouting offers a distraction from some of these modern trends, so let us celebrate this Founders Day/Thinking Day by offering the children in our Groups and Associations the opportunity to take part in traditional Scouting activities, as written by Baden-Powell. Together we can make a difference, together we are strongest. Annual Workshop in Spain, Alcalá de Henares, from the 2nd to the 4th of November, 2018. 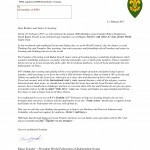 Dear brothers and sisters scouts. We invite you to Workshop 2018 in Madrid. On our website is all the information about the Workshop. Posted in Uncategorized | Comments Off on Annual Workshop in Spain, Alcalá de Henares, from the 2nd to the 4th of November, 2018. The registration papers have been e-mailed to the official contact information. Please contact office in case of any queries. A Woodbeads Part 1 Training is offered in Italy from 24 to 26 November 2017 in Abano Terme. for this years´ annual workshop your registration is expected until 31.08.2107. Please register for the workshop as soon as possible. The workshop will take place in Solanas / Sardegna. The workshop fee is 60,00 Euro. The organising team set up a number of workshops for you – you just need to register and choose the activity you like to do. It is possible to stay at the venue before and after the workshop. Use some extra days around the workshop to explore Sardinia. Please contact – workshop2017@raiderismo.it – about costs and accomodation availablilities. Do not miss this unique event. we hope to see many of you at the Workshop. !!! Please pass this information on to your members !!! April 23rd, Saint George’s Day, the day where scouts all over the world meet and re make their Scouting promises, to confirm that they are Scouts and a part of the great world Scout community. As scouts we have dreamed from our first campfire about the wilderness, the great unknown, this has always managed to wake the curiosity and fantasy of young minds and old ones too. We have inherited the longing like the wind which filled the sailors’ sails and led them across oceans to new people and countries. The same longing was there around a glow in the caravan’s campfires, crossing the prairie, on the way to the new worlds. This curiosity and the longing are the things that shall make connecting bonds all over the world to other scouts and countries, trying to understand the differences of other people and countries. Being a Scout is a major and responsible commitment to the future and yourself. A future where we can all meet in a brotherly Scouting friendship, friends with all. As scouts, we are in a community of millions of Scouts, across religion, skin color and citizenship, a great force and strength. A hope for the future, for people all over the world, about peace and living together in respect and peace. It is a big and responsible obligation, which requires both will, courage and commitment. Remember the motto from the first Euro camp, “Together we are strongest”. 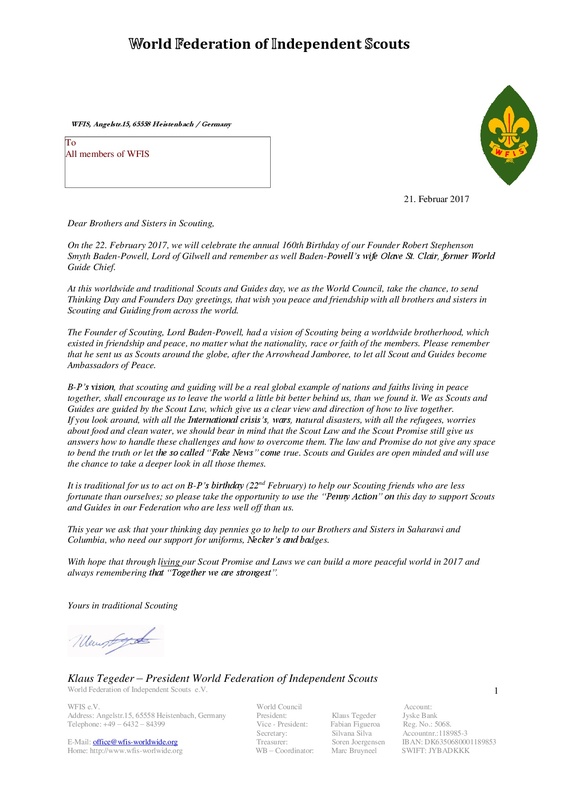 on behalf of Margon Sorensen – 1st Chairman – WFIS-Europe e.V. How sad, that in the last year we have seen so many conflicts and so much misery across the world. Many of our Beavers, Cubs and Scouts will grow up to become leaders at work, in their communities and even of their countries. As we celebrate Founders Day/Thinking Day, let us help to put the spirit of Scouting in every child in the hope that this spirit will remain with them as they go through life and help them to make good decisions in their adult life. 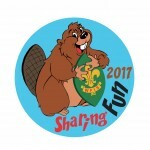 The Beaver Project – Sharing Fun is for Beavers all over Europe. 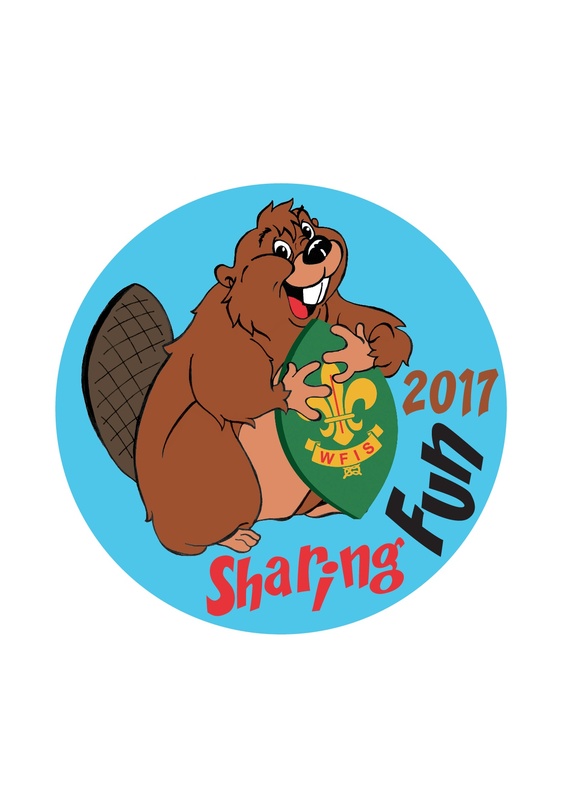 Through the sharing of fun Beavers from different areas or countries can share fun with other Beavers from WFIS – Europe.